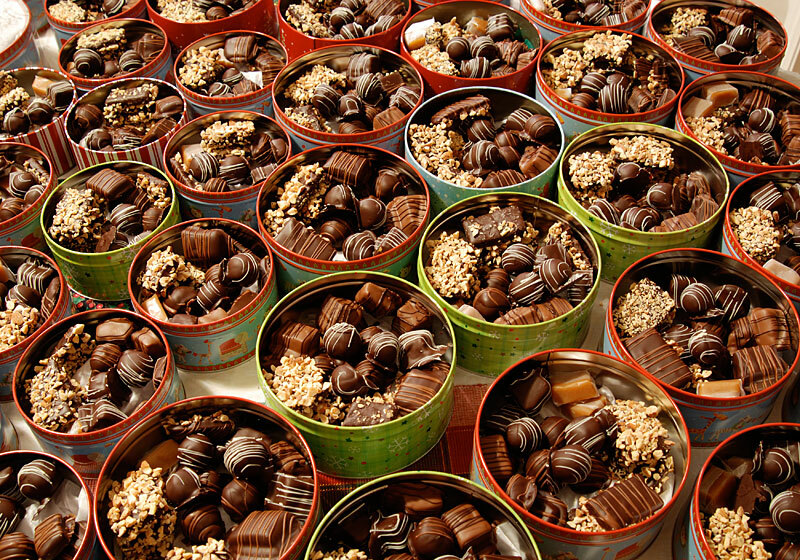 Pictured above is this year’s batch of holiday candies. I started with 17 pounds of chocolate, 10 pounds of sugar, 1 1/2 gallons of heavy cream, 5 pounds of butter, 1/2 gallon of corn syrup, 10 pounds of almonds and a few other ingredients to produce about 50 pounds of candies. This year I made 7 different kinds of candy: English Toffee, Coffee English Toffee, Classic Cream Caramels dipped in milk chocolate and another batch just wrapped, Espresso Caramels, Gianduja Truffles, Mocha Truffles, and Pecan Maple Caramels. I will share more detailed photos of each in a later post. With each holiday season comes a return to The List, which I use to manage recipients of holiday candies. The total number of recipients has been hovering at just over 40 recipients over the years to divide the nearly 50 pounds of candy between. I wish I could make 100 pounds of candy, but I just don’t have the time. It is always a challenge to pick out 40 or so recipients from the ever growing list of friends. Read more about the challenges of maintaining the list. I almost thought my chocolate tempering machine broke while dipping caramels. The display started to flicker, the motor sound changed. To be honest, I was almost relieved, since I still had to make and dip truffles. A broken tempering machine this late in the season would mean no more candymaking and a much needed rest for me. The past few years I have been taking a few days off of work in mid-December to help absorb the more than 40 hours that go into my annual candymaking marathon (read about last year’s). I wasn’t able to take time off this year since I just started a new job, and needed what little vacation time I had for the Holidays. The tempering machine hung in there, and apart from making a few strange noises that night, continued to turn out great tempered chocolate for my caramels and truffles. This entry was posted on Saturday, December 29th, 2007 at 12:27 pm	and is filed under Candymaking. You can follow any responses to this entry through the RSS 2.0 feed. You can leave a response, or trackback from your own site. Well done Brian! Your chocolates look amazing, and I’m sure that every single recipient knows just how special they are, and how lucky they are to receive such a generous gift. Damn, that’s quite the candy marathon you had there. 40hrs of candy making may have driven me mad. Fifty pounds of candy to forty people, you should be commended! Erika, I am hearing from former co-workers that are missing the chocolates, though I will stop by next week to deliver some. Thanks for the compliment and Happy New Year! Jef, if my machine really broke, I probably would have gotten a bigger one, but sometimes the little breaks while tempering more chocolate can be nice. I have similar problems with the chocolate whirlpool. Fortunately, the whirlpools don’t stay up as late as I do when making candies. Making so many candies is a lot of work, but folks are so grateful, so it is worth it. 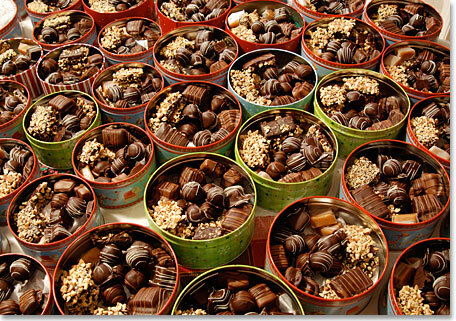 Next year, I will have some vacation time dedicated to make candies. Wow, that is dedication…your chocolates do look great. Do you have a time frame for a “second list?” Maybe by next Christmas? Amazing! Can I be added to your list next year? Thanks for a delicious 2007! This has to be my new favorite website! I love all of the different recipes here…especially being that they are related to chocolate!!! IT’S WONDERFUL!!! Hi Mary, I’m eagerly awaiting the return of your tin and mystery contents, wondering if beads will be included . Would you believe one recipient that we mailed to sent it back with her thank you card?! Smart thinking because they almost got dropped for next year! Rebecca: I’ve pondered a second ‘buy’ list, but during the holidays one list is enough. Perhaps during mid summer I may do a smaller grouping of candies for blogging audience. Kieran: I’ve pondered international shipping, but for now Hawaii an Montana are as far as we have gone. JEP: I have to say the holiday list is capped, but I’m thinking about another run later in the year. Who knows? Giselle: Thanks for the kudos. I’m not into posts sans food/just about me, so I may have to pass on the tag. You’re inspiring me to keep on candymaking! I just wish there were a few more weeks to rest up until Valentine’s Day. What I know about tempering is very limited. I know that it makes the chocolate glossy and smooth, but isn’t melting enough? Please explain, if you would, and give me a manufacturer-name of your machine, and the larger capacity version. Also, wondering if you ever came across the square silicon pans we talked about. I (and others) enjoyed the caramel making this year so much that I’ve been asked to supply after-dinner candies for the elegant dinner party of a friend. (Yikes.) Also, please consider including me on your blogging audience of candy recipients, if you ever reach that point. Thanks! Brian: Yes, you’re tucked in there w/my other favorites. You had so many great caramel recipes here it was hard to decide which one to choose! Mallory: I put the silicone pans on my wishlist but nobody delivered. I made do with 2 siplat mats, though for the 3rd batch of caramels I had to use foil (and hated it). I’ll probably pick some up in the next few months. I added a bunch of resources to sites that have overviews of tempering on my tempering chocolate page. Also, check out the tempering machine page for resources to tempering machines, including my own model. Wow. Just….wow. You have some lucky friends! Wow! I know I’m way late on this post, but I just discovered your blog today. How long before Xmas do you make the candies (i.e., how long does it keep?) and how / where do you store it until giving it out? I do some gift boxes as well every year and I love the candy tin idea, but I always end up doing very last minute. It sure would be easier if I could space it out some. I’d love to hear how you do it! Great blog! Keep up the great work. You’re an inspiration! Hi Digigirl, I usually start around the 15th of December with the hope of getting the mailed candies delivered in time for Christmas. Check out my containers page for some photos of made candy awaiting packaging. I use rubbermaid bins to store the candies until I am ready to package them. It usually takes me about 5 -7 days (working 3 -10 hours on candy each day) to get it all made and packaged. I’m making a lot (nearly $600 worth of ingredients and packaging and postage), but you don’t have to cater to 40 plus gifts unless you want to. Thanks for stopping by! I want to be on the receiving list. Have tin – need goodies! Hi Shelly, I’m afraid just any tin won’t do, has to be one you received from me! I’d be making candy 365 days a year otherwise! I’ve been thinking about making a box of chocolates for each member of my family for next Christmas- I just put a cello bag of dusted truffles in stockings this year. Your efforts are to be commended, those chocolates look beautiful and no doubt delicious. I will be returning to read about making different types of chocolates! Although I certainly won’t be making 50 pounds of chocolates, blimey!